Dainty and elegant, these anklet socks are an ideal choice for a host of outfits. The cotton-rich mixture keeps feet fresh and cool while the silky, matt finish adds a touch of class. 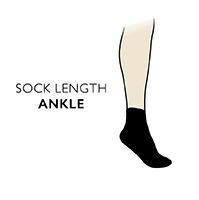 The elastane makes for a superb fit, ensuring that these pretty little socks won't lose their shape even after repeated washing. 65% Cotton content wicks moisture away from the skin, creating a healthy environment for your feet all day long.